ABK Emirates Visa Signature | Cards | Al Ahli Bank of Kuwait K.S.C.P. ABK Emirates Visa Signature card offers you a world of privilege, luxury and convenience that is tailored to suit your lifestyle. As an ABK Emirates cardholder you are automatically enrolled to the award-winning frequent flyer program Emirates Skywards. Where every time you use your ABK Emirates Visa Signature card you will earn 5 Skywards miles on overseas purchases and 3 on local purchases, for each KD 1 spent on the card. Earned miles are credited into your Skywards account on a weekly basis. Click here to find out 12 different ways on how to spend you Emirates Skywards Miles. 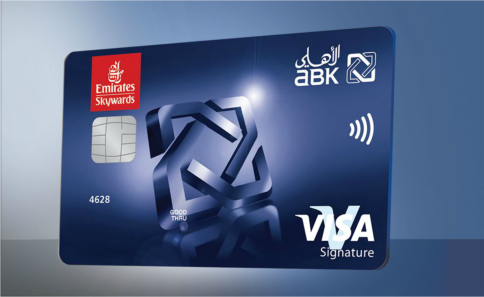 New Applicants of the ABK Emirates Visa Signature card also receive 5,000 Bonus Skywards miles, when spending KD 500 within the first 3 months after receiving their cards. Complimentary Airport Lounge Access at over 550 airports worldwide with LoungeKey. Where you will be able to enjoy free instant access to premium airport lounges (Only Cardholder) by simply presenting your ABK Emirates Visa Signature card at the participating lounges and mentioning 'LoungeKey' to the lounge staff. To view the full list of participating lounges and download the LoungeKey mobile App please click here. Your ABK Emirates Visa Signature card offers you a unique local concierge service, designed specifically to suit the needs of the Kuwait market and is supported by a variety of high quality local companies. Premium concierge services that are available 24 hours a day, 7 days a week, from anywhere in the world, delivering customised personal assistance and information in world of Dining, Travel, Shopping and lifestyle that makes your lives easier. Concierge allows you to outsource a broad range of time-consuming tasks, large and small, routine and extraordinary, with multi-language support telephone services. The ABK Emirates Visa Signature cards give you peace of mind with a full multi-trip travel Insurance coverage when you travel outside Kuwait(Ticket and origin country of travel must be Kuwait). Offered to ABK Emirates Visa Signature cardholders automatically and free of charge, subject that air tickets are purchased with the ABK Emirates Visa Signature card. (Contact Ahlan Ahli 1 899 899 to request the travel certificate). With the ABK Emirates Visa Signature card you will have access to wide range of medical and legal advice, 24 Hours a day, year round, just call the Helpline at +1 817 826 7276. No matter where you are in the world, Visa’s multilingual service representatives are on hand to assist you 24 hours a day, 365 days a year. The Contactless 'Visa payWave' technology saves you time on small value purchases by just waving or tapping your ABK Visa Card in front of a payWave reader. Existing Visa cardholders can apply for a Tap 'n' Go payWave card today with no added fees. You have to first activate the service before attempting to use it by making a EMV Chip transaction, for more information please click here. ABK SecurePay ‘Verified by Visa’ is a free online payment service offered by ABK in partnership with Visa for ABK’s Emirates Visa Premium cards. The service offers an added level of security, through a simple checkout process, that confirms your identity when shopping online with your ABK Visa card. Simply register to activate this service and protect your card against unauthorised transactions, enjoy a secure world of online shopping. For Skywards Terms and Conditions, please click here.